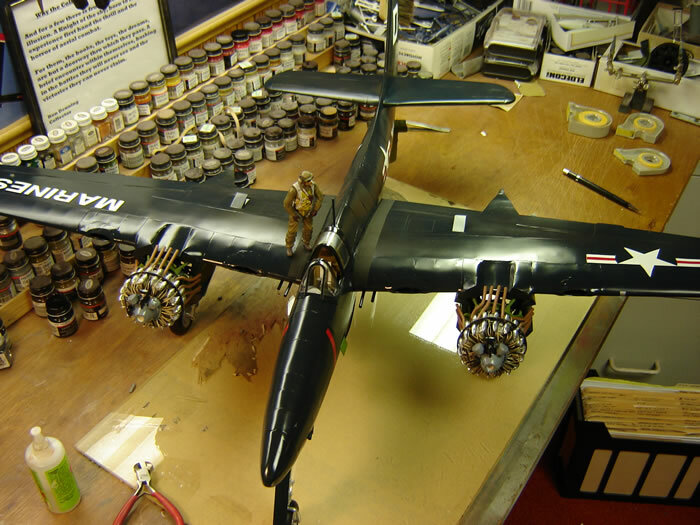 My fascination with 1:18 scale aircraft started after 21st Century Toys came out with their first model. 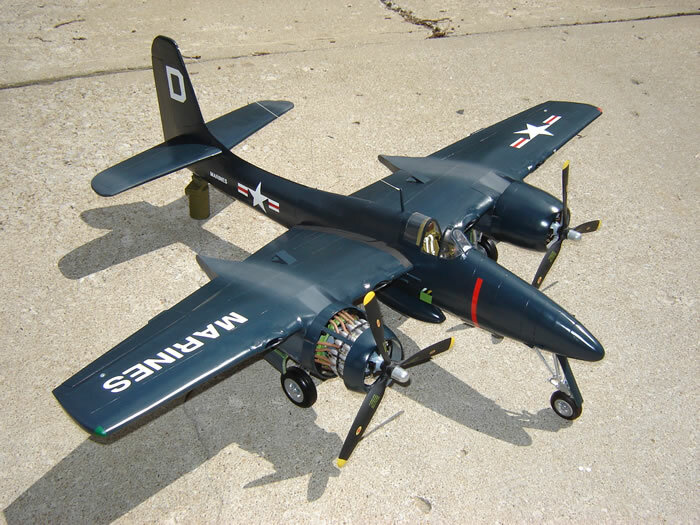 I of course wanted them to come up with a F7F Tigercat since that was my favorite airplane. After several exchanges with several of the 1:18 scale manufacturers it was evident that no one was going to produce a 1:18 Tigercat. So why not build one myself? Over the years I have compiled quite allot of information on the Tigercat including pilot manual, sheet metal repair manual, and full maintenance manuals. I obtained outline drawings of the R-2800 engine, and a whole lot of reference photos from Kalamazoo on their award winning F7F warbird. I ordered a set of RC plans from Don Palmer, reduced them to 1:18 scale and started in. The fuselage and nacelles are basic former and stringer construction with thin plastic sheet covering. 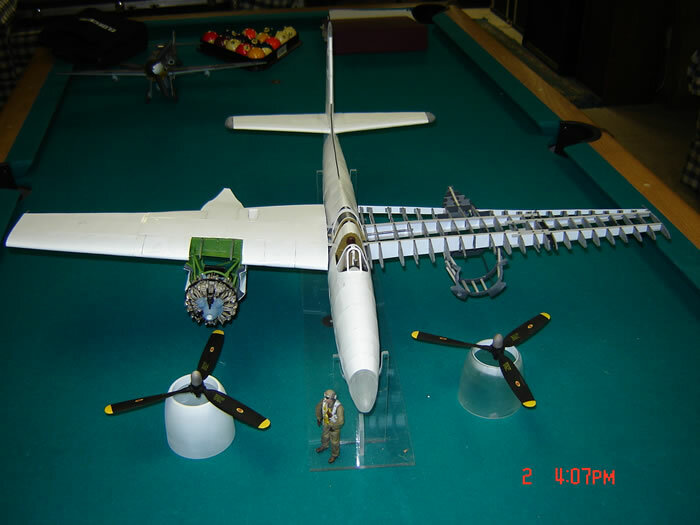 I tried to maintain the same seams in the fuselage that the real plane had. The wings are rib and spar construction and again covered with sheet plastic. 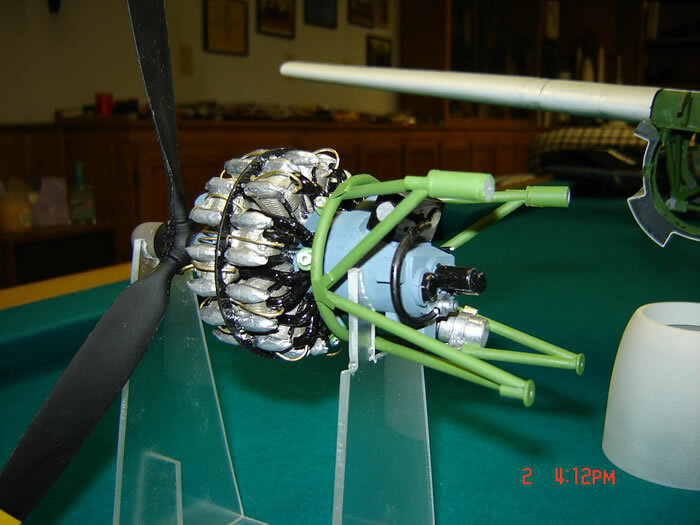 The Pratt & Whitney R-2800 engines are scratch built. The cylinders, crankcase, and reduction gear section are cast resin from a master mold that I made. Each cylinder has 2 spark plugs, ignition leads, inlet manifolds, carburetor, and exhaust stacks. The gear wells are detailed out with all hydraulic cylinders, linkages, oil tanks, water injection tanks, air and oxygen bottles. The nose 50 cal. machine guns are detailed with the blast tubes and ammo boxes which show up through the access doors below the cockpit and nose gear well. The cockpit is totally detailed with every instrument and gadget that was in the real aircraft. I was really proud of how the throttle quadrant turned out. 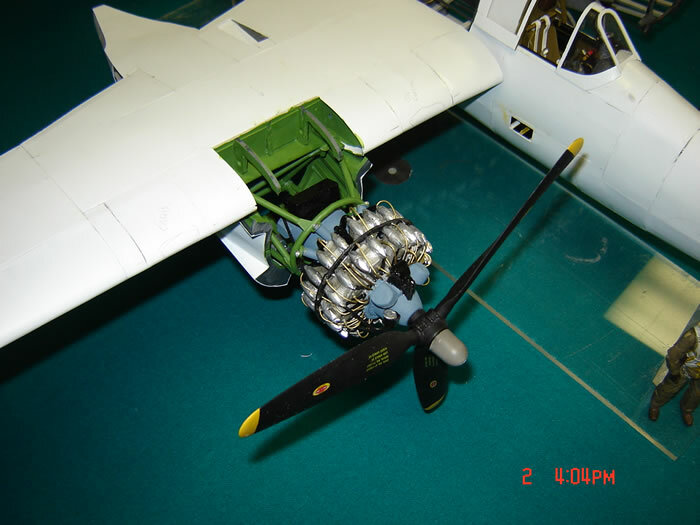 It includes all levers, and linkages back thru the cockpit rear bulkhead. Scratch build seat, rudder pedals, and seat belts finished it up. The only thing that I did not detail was the wing cannons. I got tired after 3 years, and just wanted to finish it up. Although the ribs were fabricated to receive the cannons, I covered them up.